Then Jesus six days before the Passover came to Bethany, where Lazarus was which had been dead, whom he raised from the dead. There they made him a supper; and Martha served: but Lazarus was one of them that sat at the table with him. Then saith one of his disciples, Judas Iscariot, Simon’s son, which should betray him, “Why was not this ointment sold for three hundred pence, and given to the poor?” This he said, not that he cared for the poor; but because he was a thief, and had the bag, and bare what was put therein. From this passage, we know that the Spikenard oil or ointment was very costly, was very fragrant and aromatic, and that Jesus’ feet were anointed with it as a kind of ritual to prepare him for his burial, and the ordeal on the cross that he would shortly face. The whole episode presages Jesus’ impending crucifixion, death and resurrection. But what exactly is this mysterious Spikenard Oil? And can it still be obtained today? 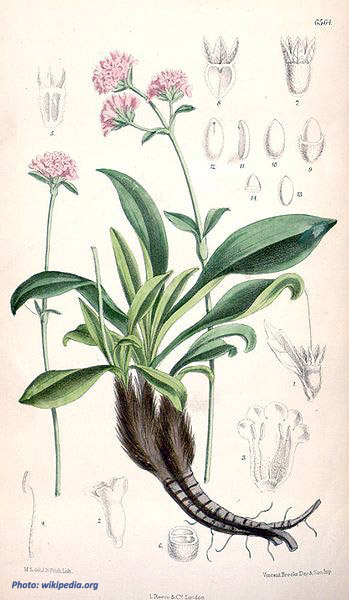 The Spikenard that was the base for this fragrant or aromatic ointment is known to be Indian Spikenard, also called Indian Valerian, which goes by the name of Jatamansi in Indian Ayurvedic medicine. The botanical name for this herb is Nardostachys jatamansi. In Chinese herbal medicine, it goes by the name of Gan Song, which literally means, “Sweet Pine”. However, this is not the only plant that goes by the common English name of Spikenard. There is American Spikenard (Aralia racemosa), which is a close botanical relative of Ginseng. Similarly, American Spikenard has adaptogenic and energy tonic properties like Ginseng, and helps the body’s immune system to throw off colds and respiratory infections as well, but its medicinal and therapeutic properties are far removed from those of Indian Spikenard. American Spikenard is moderately aromatic, but not nearly to the same degree as Indian Spikenard. This is just one example of how common English names for medicinal herbs can be misleading. Indian Spikenard does indeed have a strong fragrance or aroma, and a musky odor quite similar to that of the more common Valerian root (Valeriana officinalis), but rather more pleasant, while still being earthy and woodsy. It also has similar sedating and relaxing qualities, but according to Indian Ayurvedic medicine, whereas Valerian is more Tamasic in nature, and dulling to the higher mental and spiritual faculties and perceptions, Jatamansi does not have these drawbacks. Instead, it is a mood elevator and enhancer that calms anxiety and heals emotional and psychological trauma and pain. Its calming, soothing and mood elevating qualities were used to help Jesus prepare himself spiritually for his upcoming ordeal on the cross, and his subsequent death and resurrection. The Indian Spikenard or Jatamansi herb could have been the only one used to medicate and perfume the ointment or scented oil that anointed the feet of Jesus, or it could have been combined and enhanced with other sweet smelling fragrances, like those of Cinnamon and Cardamom. You see, like Valerian root, Jatamansi or Indian Spikenard has a very heavy, musky odor that is, by itself, not that pleasant. But when combined with other aromatic herbs and spices, its strong musky odor has the property of being a fixative, or an aromatic ingredient that strengthens the odor, strength and staying power of the other aromatic ingredients in the ointment. In return, these other sweet smelling aromatic herbs and spices transform the strong odor of the Jatamansi or Indian Spikenard into something much more pleasant. A common vernacular name for both kinds of Valerian, Indian and otherwise, is Musk Root – a name which is due to its strong, musky odor. True Musk, however, comes from the scent gland of the Musk Deer, which is also highly valued, both as a perfume and as a medicine. Substances which are strongly aromatic, such as Musk, have the medicinal ability to revive and resuscitate consciousness, much as Sal Ammoniac or Smelling Salts were used at the turn of the previous century. These super aromatic substances, like Musk and Camphor, also have the ability to penetrate and open the vital and sensory channels and orifices in heart and circulatory conditions, as well as convulsions and seizures, when skillfully used and combined with other medicinal herbs. Besides the scent gland of the Musk Deer, the scent glands of other animals were also used medicinally, as well as in perfumery; these include the beaver, from which we get Castoreum, as well as the wild Civet Cat. Way back in the eighties in the Chinese herb stores of southern California, authentic Musk from the Musk Deer was still available. I remember, as a newly licensed acupuncturist and practitioner of Oriental Medicine, treating a young lady who had a kind of epileptic condition in which she was prone to periodic fits of drooling, spasms, catatonia and seizures with an herbal formula I made up which contained Musk from the Musk Deer. It worked surprisingly well in ameliorating and managing the young lady’s symptoms, although I would not call it a complete cure. There was also a kind of herbal patent medicine that was available back in those days, called Da Huo Luo Dan, or “Great Activating the Channels and Collaterals Pills” which contained many aromatic ingredients, including Musk; it was used for a weak heart and circulatory problems, and to revive the Vital Spirits. In Aromatherapy, it is well known that natural fragrances and essential oils have a powerful effect on the mind and Spirit. This is because the sense of smell is our most primitive sense; anatomically, the nasal chambers lie directly beneath the frontal lobes of the brain, affecting the latter by their sheer proximity. Powerful fragrances also have the ability to awaken long lost memories and emotional associations, which can be either pleasant or unpleasant, depending upon the particulars of the aroma, and its associations in the individual’s past. As proof of the ability of scents and aromas to exert a powerful effect on the mind and consciousness, not only within the human species, but in other species as well, we need only think of how cats go crazy for Catnip. Aromatherapy usually involves the inhaling of fragrant essential oils for their scent, and the power that various natural scents have on our vitality levels, moods and emotional states. Yet there are other ways to use fragrant or aromatic natural substances medicinally, and these involve their topical application in ointments, liniments and massage oils, as well as their internal ingestion in the form of teas and powders, pills and capsules, or even in the form of medicinal pastes, or electuaries, commonly called Majoon in the Middle East. What are the basic properties of aromatic medicinal substances like Indian Spikenard, which enable them to exert their medicinal effects? First of all, aromatic substances are penetrating and volatile. This penetration and volatility enable them to penetrate and open the pores and channels of the body, both subtle and gross, to break up congestion and stagnation, and their volatility stimulates the circulatory and metabolic processes of the body and the parts into which they penetrate to disperse that stagnation, blockage or congestion. In the skin, essential oils and oleoresins that are exceptionally light and volatile can open the pores to induce sweating where that is desired in the process of detoxification, or to sweat out a cold or respiratory tract infection. In the digestive organs, aromatic substances can break up congestion and blockage, and stimulate digestive metabolism and functioning. In the musculoskeletal system, aromatic essences can penetrate tense, tired or inflamed muscles to soothe and loosen them, having a relaxing and antispasmodic action, and in the process, they can also relieve pain and soreness. The Indian Spikenard ointment that anointed the feet of Jesus had a relaxing, loosening and antispasmodic action to soothe pain, relax sore, tired muscles, and to help him let go of his suffering and attachment to the physical body and its inevitable traumas in preparation for the transformation and metamorphosis that he was about to undergo. Topically, the essence of the Spikenard penetrated into his muscles and tendons, and aromatically, its scent had a soothing, relaxing, mood elevating effect on Jesus. Another interesting property of aromatic medicinal substances is that they are antiseptic, helping the body to fight off infections and sepsis from pathogenic bacteria and microbes. The way that early healers discovered this property was very direct and experiential. They saw that putrefactions and sepsis, whether occurring inside the body or outside of it, as in spoiled or rotten food, invariably produced a foul, rotten odor; for a woman, a good example would be a vaginal yeast infection. What better way to fight a rotten smelling infection than with sweet smelling aromatic substances? Some of the strongest natural infection fighters we have are aromatic essential oils that are distilled from medicinal herbs. Of these, Thyme Oil, followed by Oregano Oil, are two of the strongest. Even Cinnamon has a beneficial antiseptic effect on many morbid or pathological microbes, while promoting the growth of friendly ones. And Indian Spikenard or Jatamansi Oil has the ability to fight off fungal infections, just as its botanical relative, Valerian does. Garlic was used by the English in World War II to fight infections, since the supply of antibiotics ran low during the war. Garlic, Valerian, and to a lesser extent, Indian Spikenard, don’t have aromas that are that pleasant, but they are indeed strong and powerful. Perhaps their smell is so strong that it overwhelms or overpowers the pathogenic microbes, which flee in terror! Yes, aromatic medicinal substances such as Spikenard Oil are legendary, and have a long history of use in medicine, both ancient and modern. In the ancient world, the Egyptians were especially famous for their use of aromatics, both in perfumery and in medicine, and in the embalming of their mummies. The Spice Trade between Europe and Asia that went through the Middle East and along the Silk Road was not just for gourmet cooking use, but more importantly for medicinal use, and many old medicinal formulas contain many aromatic herbs and spices as ingredients. Just about every balm, unguent, ointment or aromatic substance that you can find in the Bible, or in other hallowed scriptures or manuscripts from antiquity can be traced down and found today with enough patience and persistence, as well as the proper insight and guidance to discern its true identity. This was written by David Osborn, MH - L.Ac. Posted on at 7:02 am. Filed under Herbs, Traditional Medicine. Tagged Aromatherapy, fixative, Indian Spikenard, Jatamansi, Jesus, Musk, perfumery, Spikenard, Spikenard Oil, Spikenard Ointment, Valerian. Bookmark the permalink. Follow comments here with the RSS feed. Post a comment or leave a trackback. 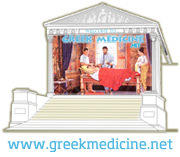 ‹ THE MARCH OF MEDICAL PROGRESS – BUT TO WHERE?